I can honestly say that I have enjoyed every minute here in New Zealand. Everything I have chosen to do and experience has resulted in some sort of positive outcome. Even the time we stayed the night in a shabby hostel with no heat in the dead of winter, we now have an amusing story to laugh at and we know it can’t get much worse. Although I have no regrets, I have recently been thinking a lot about why I came to New Zealand. I have come up with seven main reasons that drew me here. The last one is what has been bothering me. This country is notorious for its natural world and the availability of outdoor recreation, but I have yet to take full advantage of it. As Mark and I hiked down to the lake last weekend, we talked about how we both felt the same way. Mark took a NOLS trip a couple years back and is also an avid climber, so he holds a large passion for the outdoors. 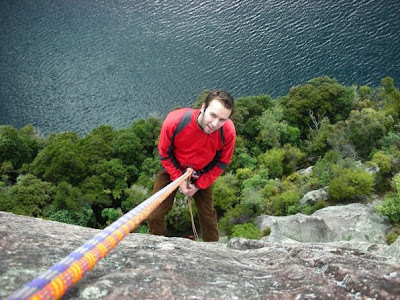 He has kept in contact with Alicia, our Australearn program instructor, who is also a climber. She and her husband spend a lot of time at the local climbing gym and Mark has joined them for a few trips. They recently invited him on a weekend climbing/camping trip and while we were on our long trek back up the mountain, he asked if I wanted to tag along. Although I have only done basic climbing a handful of times, I could not turn down the opportunity. Mark and I stocked up on essential food for the weekend (peanut butter, tuna and bread) and Alicia picked us up on Thursday evening. We drove a couple of hours to meet her husband Forbes and camp for the night. 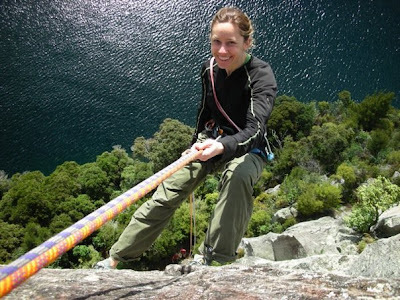 Forbes is an instructor for AUT’s Outdoor Recreation and was in the middle of a class trip. We met about 15 students and four instructors just in time to set up our tent and get to sleep. The group was exhausted from a full day of climbing and they were already in their tents when we arrived. It was only around 10 p.m. but we had no other option than to also get in our tent and try to sleep. Mark had a few movies on his iPod so with a watchband and a little patience he was able to creatively rig it to the top of the tent so we could watch a movie before falling asleep. 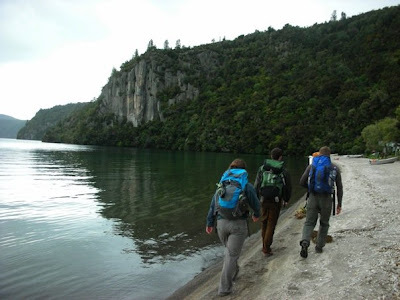 We woke up early the next morning and drove to Kawakawa Bay for the first day of climbing. It took us about an hour to hike in and once we were there we split from the rest of the group. 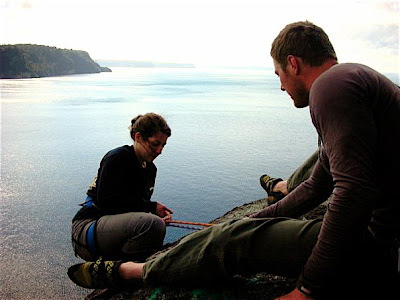 The class was working on technical aspects so Mark, Alicia and I went off to climb for fun. I had conveniently borrowed a harness from a friend in my building, but it was difficult wearing normal sneakers instead of climbing shoes. Mark and Alicia were both really supportive and found good climbs for a beginner. Climbing may look easy, but getting in the rhythm of pushing off of one leg at a time while thrusting the rest of your body as high as possible is not a natural technique for me. Although I struggled a bit, I eventually made it to the top of each pitch and was able to turn around and see only the clear blue Lake Taupo beneath me. Climbing is so rewarding because each time you actually have an established goal of reaching the top. Getting there makes all of the hard work worthwhile. I also really enjoyed watching Mark and the others climb. I had no idea Mark was so experienced and it was a bit of a shock to watch him climb so smoothly and make even the most difficult pitches look effortless. I would love to reach this point where each swift movement falls into the next while keeping a rhythm with little hesitation, but right now I need a lot of practice. After a lunch of peanut butter sandwiches followed by more climbing, the class left to go back to Auckland and we headed to our next campsite. We ditched the car and Mark, Alicia, Forbes and I piled into another instructor’s van. 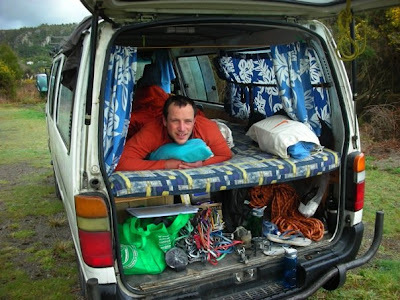 Hannes is a “German Kiwi” who also works for AUT Outdoors. He had an awesome road-trip van complete with curtains and a full bed in the back. We drove down a rutted dirt road in the pitch-black and arrived at a Maori Village on Whanganui Bay that permits climbers to camp on their land for a small fee. We ate our tuna sandwiches in the cold and did not hesitate to pitch our tent and get into our warm sleeping bags. Mark and I definitely didn’t need a movie this night due to pure exhaustion from the busy day. When I woke up the next morning I realized we were actually on the western shore of another part of the vast Lake Taupo. We didn’t waste much time and began climbing "Tibia" almost immediately after breakfast. Hannes went up first to set the gear and I followed soon after. I was pretty confused about what we were doing or where we were climbing but I was just told to follow the rope up. Mark let me wear his climbing shoes to make it easier and I began climbing upward. As soon as I reached the crack, I was told to look left and saw a skull surrounded by tibia bones glaring back at me. Ah... tibia now made sense. I continued on with my back to one wall and my feet on the other, and was able to maneuver myself up to a ledge to meet Hannes. He set me up to belay Mark and then continued to the next pitch. The final pitch of the climb was the most difficult for me. Again, there were two rock faces to use, one with a large crack in it. They were positioned much further apart than the previous ones which made it difficult for a person with short legs. By jamming my toes in a crack or shoving my arm in up to my shoulder where it wouldn’t budge, I was able to get my back foot up just a bit higher each time and shimmy up the climb. Mark was below helping me find holds and Hannes was encouraging from the top, but at times my back leg would be shaking so uncontrollably from tired muscles I did not think I was going to make it. When I finally reached the top, Hannes told me just to flop my body over the ledge like I was getting out of the pool and I could barely gain enough strength to do that. But once I did, I finally realized what it meant to climb Tibia. 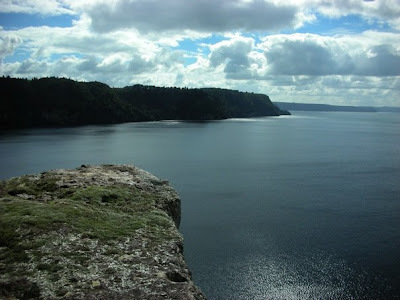 We were about 50 meters high looking out on an astounding view of the coastline and sparkling water. Then came the best part: the abseil (or repel). I have now done quite a bit of abseiling and wouldn’t say I am scared of heights, but I have never done anything this high before. I was a little hesitant when Forbes told me to just walk over the edge, but once I did I loved knowing I had full control while descending down the side of a cliff. Later in the day, more friends of Forbes and Hannes came and I was able to watch everyone complete more difficult climbs while I explored the area. I attempted another climb, but I felt so satisfied after accomplishing Tibia that nothing else could compare. That night, three others joined the camp so we talked and laughed over dinner, listened to the didgeridoo and cringed at other’s failed attempts at the instrument. Follow the big crack in the middle of the rock to the top ledge of the Tibia climb. And if you look closely, you'll find mark in the middle of another climb. We had a little bit of rain the next morning and wet rock is not apt for climbing. Instead of staying as planned, we left the Maori campsite, picked up Alicia’s car and headed to Mangaokewa. 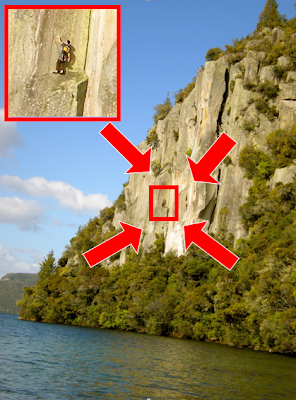 Mangaokewa is a steep crag with a large overhang that allows it to stay dry from the rain. When we arrived, there were already some other climbers also taking advantage of the dry area. The whole atmosphere was extremely welcoming and supportive. I felt pretty insecure initially because I was obviously the most inexperienced one there, but it quickly became clear that everyone is willing to help you get up on that rock and succeed. Although my tired muscles did not make climbing easy that day, I just truly enjoyed watching and participating in such a relaxed and encouraging environment. Its good to see you're getting high! haha But seriously, this looked like an awesome trip and I'm glad you're getting out and having fun adventures. Keep the stories coming.